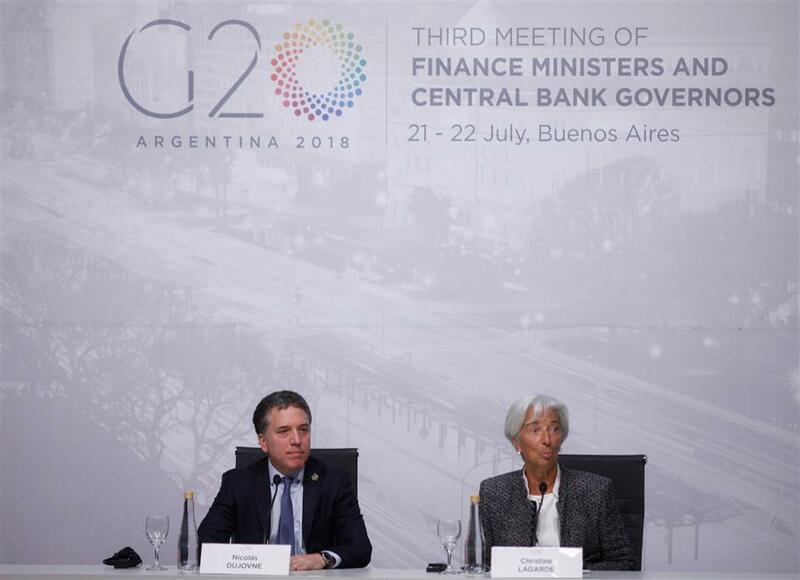 Finance ministers and central bank governors of the Group of 20 (G20) ended their third meeting of the year in Buenos Aires, Argentina on Sunday. International Monetary Fund (IMF) Managing Director Christine Lagarde and Argentina's Treasury Minister Nicolas Dujovne attend a news conference in Buenos Aires, Argentina, July 21, 2018. Finance ministers and central bank governors of the Group of 20 (G20) ended their third meeting of the year in Buenos Aires, Argentina, on Sunday, pleading for increased dialogue to defuse escalating trade tensions that could hit global economic growth hard. The meeting comes at a time when US President Donald Trump’s protectionist policies have provoked ire from traditional allies such as the European Union, Canada and Mexico, and sparked a series of retaliatory measures. The G20’s final communique stressed “the need to step up dialogue and actions to mitigate risks and enhance confidence” amidst fears of an escalating global trade war. It also touched on the application of technology in the financial field and the promotion of greater investment in infrastructure. The group reaffirmed its commitment to “monitor debt vulnerabilities in low-income countries,” as well as grant tools and minimize risks in the face of the recent volatility of the financial market. “The financial system must remain open, resilient and supportive of growth,” the influential group said. “We remain committed to the full, consistent and timely implementation of post-crisis reforms and to the evaluation of its results,” read the statement. Argentine Treasury Minister Nicolas Dujovne said at a press conference that the international meeting was successful. “In this group we have to facilitate consensus, and constructive dialogue is an essential part of that job,” he said. He added that a “unanimous consensus” was obtained on issues discussed though the world faces “challenges” related to irregular growth. There were 57 representatives taking part in the G20’s Third Meeting of Finance Ministers and Central Bank Governors, among which there were 23 ministers and 14 presidents of monetary entities. Managing Director of the International Monetary Fund Christine Lagarde met with Argentine President Mauricio Macri and Dujovne during her stay, discussing the US$50 billion financial program that both parties recently agreed on. The ministerial meeting in the Argentine capital was the third of five meetings that finance ministers will attend ahead of the G20 Leaders’ Summit, to take place from November 30 to December 1. According to information from G20, its member countries represent 85 percent of the world’s GDP, two-thirds of the global population and 75 percent of international trade.